The Church of England failed to anticipate the opposition to appointing a bishop who would not ordain women priests, a report has found. 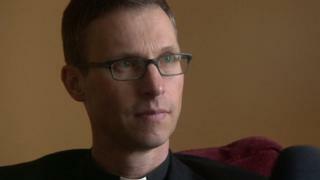 The Right Reverend Philip North turned down the post of Bishop of Sheffield in March for "personal reasons" following objections to his stance. Sir Philip Mawer's report said the nomination was "a surprise to many". The Archbishops of Canterbury and York said his review was "detailed, thoughtful and authoritative". The Church of England's most senior clergymen - the Most Reverend Justin Welby, the Archbishop of Canterbury, and the Most Reverend John Sentamu, the Archbishop of York - said they would read the report, discuss it with the House of Bishops and would respond "in due course". They had called for an independent inquiry into the circumstances surrounding the failed appointment. A Diocese of Sheffield statement said: "There is no denying the wounds many of us have sustained during the past months, but now is the time to commit to moving forward with a renewed focus on reconciliation." Mr North, who is the Bishop of Burnley, said when he rejected the nomination: "It is clear that the level of feeling is such that my arrival would be counter-productive in terms of the mission of the Church in South Yorkshire and that my leadership would not be acceptable to many." In 2012 he was chosen as Bishop of Whitby but did not take up the post. The review found the nomination was "entirely consistent" with a general synod settlement in 2014 that allowed the consecration of women as bishops. Sir Philip said the story of the Sheffield nomination was "not populated by villains but by people who were simply seeking to do their best". He said the there was "no merit" in "searching for scapegoats". "If those in the minority wish to continue as honoured and full members of the Church of England, they need to ensure that they act and speak in ways which show understanding of the position of ordained women," he added. He also suggested further consideration of the "theological and pastoral issues" raised by the settlement in 2014. The Very Reverend Dr Pete Wilcox is to be installed as the next Bishop of Sheffield on 23 September 2017 at Sheffield Cathedral.